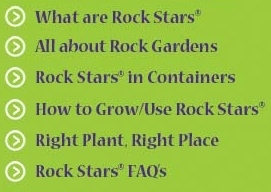 If you're a member of the media, sign up below to receive timely eMail Alerts about Rock Stars®, other perennial products, services and special events. As we have news to report, we'll email you news releases, event schedules, trade show listings, new plant announcements, plant photography and more. If we've assigned you a username and password, you can login into our Media Center here.